We are happy to announce that we have now moved into a new office headquarters. DevStat continues to grow and as a natural step of that growth we need more space. 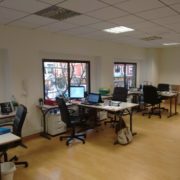 Our new office is significantly larger, and if gives our staff a greatly improved working environment, as well as room for continued expansion. From our new office we will be able to work even more effectively. The fact that this move has happened as we are celebrating the company’s 12th birthday, is symbolic of the long-term success of the company. We would like to take this opportunity to thank everybody who has contributed to the company and its success. The visiting address of our new office is Av. Barón de cárcer, 26 – First floor, 46001 – Valencia. Our telephone number has also changed to (+34) 962 069 190. All our other contact information stays the same. As usual, we will be more than happy to welcome you at our new office building.